We’d love your help. Let us know what’s wrong with this preview of EcoCities by Richard Register. Most of the world’s population now lives in cities. So if we are to address the problems of environmental deterioration and peak oil adequately, the city has to be a major focus of attention. Ecocities is about re-building cities and towns based on ecological principles for the long term sustainability, cultural vitality and health of the Earth’s biosphere. Unique in the li Most of the world’s population now lives in cities. So if we are to address the problems of environmental deterioration and peak oil adequately, the city has to be a major focus of attention. Ecocities is about re-building cities and towns based on ecological principles for the long term sustainability, cultural vitality and health of the Earth’s biosphere. Unique in the literature is the book’s insight that the form of the city really matters – and that it is within our ability to change it, and crucial that we do. Further, that the ecocity within its bioregion is comprehensible and do-able, and can produce a healthy and potentially happy future. 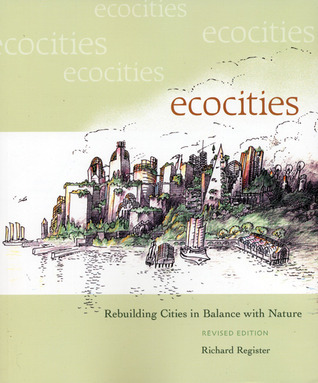 Ecocities describes the place of the city in evolution, nature and history. It pays special attention to the key question of accessibility and transportation, and outlines design principles for the ecocity. The reader is encouraged to plunge in to its economics and politics: the kinds of businesses, planning and leadership required. The book then outlines the tools by which a gradual transition to the ecocity could be accomplished. Throughout, this new edition is generously illustrated with the author’s own inspired visions of what such rebuilt cities might actually look like. To ask other readers questions about EcoCities, please sign up. Not what I was looking for. This isn't so much a how-to manual for building ecocities as an academic wankfest for environmentalism. I could see my mistake from the first chapter, when I suffered through pages of doomsday philosophy about peak oil and people "worshipping at the altar of diversion from nature" (television) and so on. Mind you, I don't disagree with the author's core sentiments. We should be building compact, walkable cities, not investing in better hybrid cars and 'green' building Not what I was looking for. This isn't so much a how-to manual for building ecocities as an academic wankfest for environmentalism. Mind you, I don't disagree with the author's core sentiments. We should be building compact, walkable cities, not investing in better hybrid cars and 'green' buildings surrounded by giant parking lots. But such points could have been made without the extravagant polemic about humanity's impending dark age. That rhetoric puts me on the defensive, makes me approach this book and its recommendations with more skepticism than the ideas deserve. I ended up skimming the rest of the book for the drawings and their attached captions, largely ignoring the main text. The drawings are well-done and illustrate interesting concepts for architecture and city design. Everything from renditions of multi-level compact cities to concepts for snap-on umbrella cables to keep patio umbrellas from flying off rooftops. What a good idea! The text on the same page as the umbrella drawing, however, was a longwinded description of the history of Hopi architecture - and not so much "here's this specific, neat thing that the Hopi did" but vague, feel-good rhetoric about how the Hopi built environmentally-sensitive communities, by the people for the people, yadda yadda. This is a book I wish Mr.Obama would read. Well him and a lot of other leaders from local to global. Perhaps some of the suggestions in the book are too extreme, but for sure it is a way we need to start thinking about community planning and community sustainability. I am currently living in a German city where many of the core ideals Register is promoting in this book are already in existance. In a 10 minute car ride I can go from the city center in which I live to a totally rural landscape. The This is a book I wish Mr.Obama would read. Well him and a lot of other leaders from local to global. Perhaps some of the suggestions in the book are too extreme, but for sure it is a way we need to start thinking about community planning and community sustainability. I am currently living in a German city where many of the core ideals Register is promoting in this book are already in existance. In a 10 minute car ride I can go from the city center in which I live to a totally rural landscape. The grocery store sell seasonal vegetables grown locally and organically. Everything I need (besides my office unfortunately) is within walking or biking distance. People here ride bikes every day as a means of transportation and not just recreation. Garbage is sorted into recyclables, compost, paper, and trash. Very few people live in a single unattached home. Homes are compacted with gardens, small yards, or balconies with trees on the street and parks near by - and every day people are using the common spaces! None of these ideas are radical, they're just normal. And perhaps as a result of how credit doesn't really exist here, people buy things to last them longer than a season, longer than a year. Less is consumed, less is wasted, urban conscienceness is accepted as the rule, and yet it all goes unseen and the city appears like a normal functioning modern western civilization. The roll-back of suburbanism is already happening in the U.S. with more and more people moving into the city. How challenging would it really be to make every farm off-grid w/ solar panels and it's own windmill for power? How nice would it be if NYC was car free only allowing taxis and scooters? Adapting to the next evolution of a sustainable western culture will be a lot less painful than people seem to think. In fact, we might even get more out of life from a whole-sense perspective than we even could in our current fast pasted technological cities. This book will change the way you look at the outside world and how much we fight with it. All I see when driving now is sprawl, and I am much more conscious of our dependence on vehicles. This book equally covers the problems of our modern life that is out of balance with nature (car/sprawl/freeway/oil infrastructure) and provides the solutions (high-density, energy-efficient, low-impact, pedestrian-centric, 3-dimensional cities) and a solid plan to transition to ecocities as well. Richard Regi This book will change the way you look at the outside world and how much we fight with it. All I see when driving now is sprawl, and I am much more conscious of our dependence on vehicles. 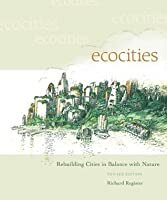 This book equally covers the problems of our modern life that is out of balance with nature (car/sprawl/freeway/oil infrastructure) and provides the solutions (high-density, energy-efficient, low-impact, pedestrian-centric, 3-dimensional cities) and a solid plan to transition to ecocities as well. "I've thought long and hard about why so few become involved in ecocity organizations and why most foundations decline to help us while telling us we are doing great pioneering work on one of the most important issues going. Now I think I know the answer. We point the finger at ourselves, and only a few are strong enough to face that truth in us. It's one thing to blame distant corporations, globalization, the loggers and industrial farmers, the greedy shareholders, power-hungry executives, vote-grasping politicians, and those other folks who drive their cars too much. It's quite another thing to see that we may all have to change – "We have met the enemy and he is us" – and not only that, but build something that has never been built before. The ecocity organization requires three rare things of its members: a willingness to confront our complicity, a great deal of creative imagination, and hope in the face of depressing facts about biodiversity collapse and climate change. A very small band of supporters from a diversity of perspectives – barely enough to keep things going – is all we have had for more than thirty years. But the point of greatest resistance, in typical paradigm shift theory, is also the place where we may well have the real breakthrough. Nobody said this would be easy." I thought this was a great idea, but I felt that the book lacked focus and really drifted a lot. I found the author repeating concepts and stories frequently throughout the book and only towards the end start to talk about real solutions. Overall, I enjoyed the book but I would have liked more structure. So far, exploring the potentials that cities have for being more ecologically sound than rural living. Begins with peak oil and the question of how people will live when this is no longer available for transport, agriculture and the like. Quite helpful for my thoughts on these matters which certainly are often present. Gives you a whole new way to look at cities and a new idea about cities could be like. Though Register went to far with some of his ideas, where he celebrate the primitive and glorifies the pre-industrial time. That said, it's a visionary book which gives you a new outlook.